The most popular and mystical procedure of our time. Avoid costly and risky cosmetic surgeries such as eyelid correction and wrinkle reduction. Fibroblast, new revolutionary non surgical lift treatment is highly effective and great alternative to surgery. During the procedure tiny plasma flash also referred as an electrical arc is being discharged from the tip of the Fibroblast hand piece. The tool itself never touches the skin however plasma flash creates a tiny dot upon the contact. There is no cuts, no blood. This innovative technology uses sublimation process, turning solid directly to gas to tighten skin tissue. Targeted tissue sublimate, causing no damage to surrounding areas or deeper skin layers. Further points are applied creating a symmetrical grid over the treatment area. Effects are noticeable right away. Full results become visible after 2-4 weeks. Patient can resume regular activities right away with minimal discomfort. Numbing cream is used to minimize discomfort during procedure. Side effects are minimal and complications rare. Carbon crusts, a tiny superficial dots which form directly on the skin are part of normal healing process. Correctly treated with after-cream will cause no threat and fall off 5-7 days after treatment. 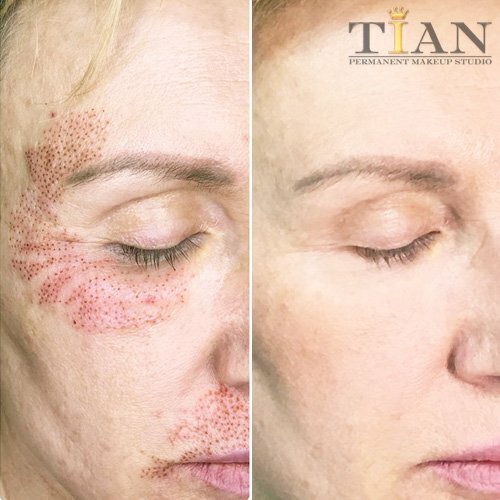 Immediately after the treatment the skin will be reddened and lightly swollen. This will usually last up to 3 days, although slight redness may remain for up to 2 weeks. Before the procedure you should tell your practitioner about any recent medical conditions and medications taken. Mention any surgeries or aesthetic procedures performed currently on your skin. Принцип работы Pelsar основан на использовании электрической плазмы. Между наконечником иглы аппарата PELSAR и поверхностью кожи происходит разница потенциалов. Газ между иглой и кожей ионизируется, появляются заряженные частицы – электрическая плазма; можно наблюдать искру между наконечником иглы и кожи. Под воздействием электрической плазмы происходит сублимация тканей и сокращение кожного лоскута; появляется корочка; тепло не уходит глубже базальной мембраны (в дерма). В течение недели корочки отходят, остаётся розовая кожа; после этого можно наносить макияж; цвет кожи выравнивается в течение 30 дней.